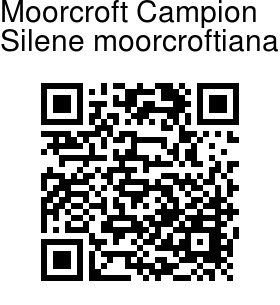 Moorcroft Campion is a clustered perennial with a woody rootstock and many erect small branched stems, 10-30 cm lonmg The stems carry one or few white or dull red flowers. Flowers are 1.5-2 cm across, petals deeply lobed, with scales in the throat. Calyx is 2.5-3 cm long, cylindrical, somewhat enlarged above, prominently 10-veined, sepals short, blunt, dark. Leaves are broadly linear, pointed. Capsule is carried on a 1 cm long stalk. 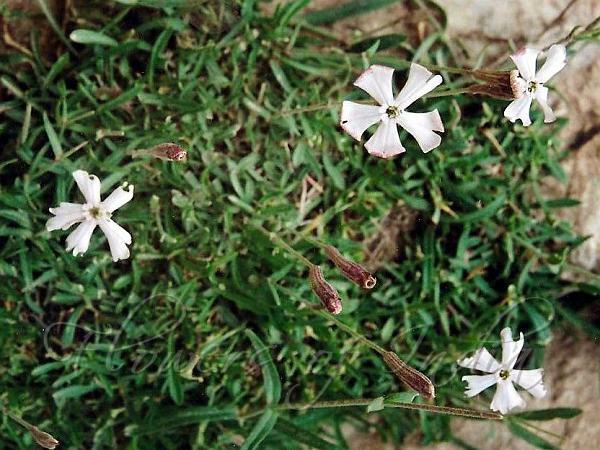 Moorcroft Campion is found in dry areas in the Himalayas, from Afghanistan to C Nepal, at altitudes of 2700-4500 cm. Flowering: June-August. Identification credit: Krishan Lal Photographed in Lahaul-Spiti, Himachal Pradesh.